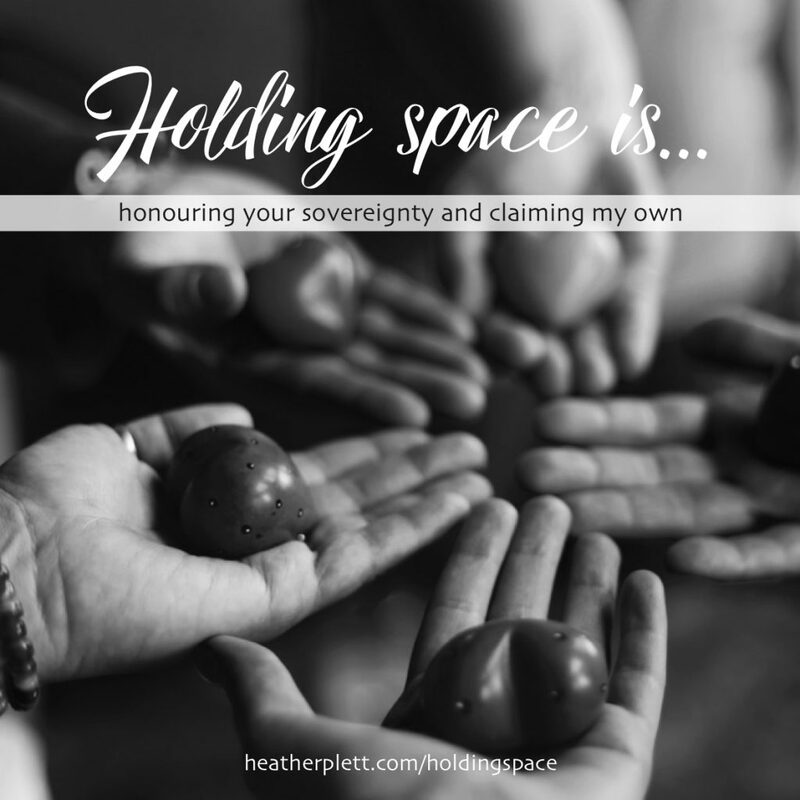 What if we claim (and honour) sovereignty in our relationships? Up until a dozen years ago, I’d only encountered the word “sovereign” in reference to God and I assumed it had something to do with being all-powerful, all-knowing, in control, and holy. I later encountered it in relation to nations, but, because I’d been raised with a highly tuned blasphemy-detector, I wondered whether that meant those nations were trying to be as powerful as God and whether governments had become “false idols”. A dozen years ago, I came across the word again when I worked in international development and my colleagues were talking about “food sovereignty”. That’s when I became curious about what I’d missed in my earlier understanding of the word. According to Wikipedia, sovereignty is “the full right and power of a governing body over itself, without any interference from outside sources or bodies”. With full sovereignty, the man can fish at the pond when/if he wants, make decisions about that pond, and choose whether or not to share the pond with his neighbours. Largely, the term is associated with nations and their governments, but what if we bring that definition down to land in our own lives? How does it change your relationship with yourself and with others if you consider yourself to be sovereign and you consider those you’re in relationship with to also be sovereign? To claim sovereignty means that I get to decide what happens to my body, heart, and mind. It means that I have agency and autonomy and am not controlled or manipulated by anyone. I get to make my own decisions and live with the consequences. I get to choose who I am in relationship with and how much space to give them in my life. I can choose to end relationships that cause me harm and walk away from situations and communities that don’t honour my sovereignty. If I treat you as someone who has your own sovereignty, it means that I assume you have the same right to self-govern your life as I do. You get to tell me how you want to be treated and I can choose to accept those boundaries or walk away. It’s what I teach in my work around holding space – that we offer love to each other without attachment, manipulation, control, or boundary-crossing. For me, and I suspect for many others, it feels quite foreign to think of myself as sovereign. I’ve got all kinds of old scripts running in my head telling me that it’s selfish to claim the “full right and power” of my own “governing body” without “any interference from outside sources or bodies”. Shouldn’t I be more agreeable than that? Should I be nicer? Shouldn’t I accommodate other people’s needs before my own? Shouldn’t I extend grace to those who interfere? Shouldn’t I overlook the boundary-crossers if they are offering me safety, protection, resources, or employment? Aren’t they entitled to certain rights if I need what they have to offer? In essence, what I did was establish a “treaty” with this person – claiming my sovereignty in the relationship and laying out the expectations for what was acceptable. “A treaty is an agreement under international law entered into by actors in international law, namely sovereign states and international organizations.” (Wikipedia) If we can bring the definition of sovereignty down to our own lives, perhaps we can also consider how that sovereignty is negotiated via treaty between sovereign individuals in a relationship? Colonizers are not respecters of treaties. They may create them, but they either use their power to manipulate what the treaties contain, or they bull-doze over them to take the resources they want. In a colonial system, everyone is impacted. Both the colonizers and the colonized become shaped by the imbalance of power and the lack of respect for boundaries and sovereignty. Some learn to take what’s not theirs and others learn that their rights are easily violated and their resources easily taken. Most of us find ourselves somewhere at the intersections – having power in some relationships and no power in others. In a colonial system, nobody walks away unscathed. Nobody ends up with a well-balanced understanding of what it means to hold sovereignty as a core value in a relationship. As a result, we have a lot of people the world over who’ve grown up with a warped sense of how to be in relationships with each other, both on a small scale and a large scale, both in one-on-one relationships and in country-to-country or community-to-community relationships. We cross boundaries, we downplay our own rights to boundaries, we fail to communicate our expectations of how we want to be treated, we emotionally colonize, we manipulate, we are victimized, and we run away from conflict because we haven’t been adequately prepared for it. We wound each other and we suffer from the wounds inflicted on us. Consequently, we face the kind of actions being challenged by the #metoo movement, Idle No More, and Black Lives Matter. And we face the resulting backlash. When colonized people rise up to claim their sovereignty, it makes those in power nervous. How do we change this? How do we decolonize ourselves and reclaim and honour sovereignty in our relationships and communities? Well, it is both a small-scale and a large scale problem (and every scale in between), so there is no one-size-fits all solution. We have to do the hard work of claiming our own sovereignty (and that needs to be accompanied with a lot of self-care and community care) and we have to do the hard work of dismantling our imbalanced systems of power. We have to practice negotiating and communicating better treaties/agreements in our personal relationships and we have to address the ways in which the colonizers in our countries have ignored and/or failed to negotiate or ratify treaties with other sovereign nations or people groups. We have to learn how to enter into conflict in more generative ways that help all parties emerge with their sovereignty intact. We have to practice having harder conversations and not running away whenever we feel attacked for violating another person’s sovereignty. We have to learn how to communicate expectations and boundaries and not be offended when other people communicate theirs. And we have to evolve the way we raise our children so that they will grow up with a better sense of their own sovereignty. I’ve begun the slow (and sometimes painful) work of decolonizing my relationships and I know that I still have a long way to go. Sometimes I feel the way I did when I first started dancing (after being raised in a no-dancing-allowed Mennonite home) – like I’m stumbling across the room stomping on people’s toes while I try to find a rhythm that fits with the person I’m dancing with. Just like dancing isn’t a natural act for someone raised with Mennonite roots, claiming sovereignty doesn’t feel like a natural act for someone raised with colonial roots. But when we learn to dance together well – like a highly-skilled pair of tango dancers – we learn to respect each other’s space, honour each other’s bodies, and not get in the way of each other’s brilliance. We find intimacy not by violating each other’s space, but by spending many hours in practice, learning to negotiate the space between us. We might step on each other’s toes now and then, but we commit to staying on the dance floor and trying again. When one person violates the agreements we’ve made, they take responsibility and we figure out how to move on. The better we become at dancing together, the closer we are to being truly free. Thank you once again, Heather. I love how you have taken an idea I vaguely (mis)understood and made it clear, applicable, and engaging. You’ve made it easy for me to see how I should start to incorporate these ideas into my own life. Thank you. OK sovereignty freedom and the right to choose may have drawbacks. if we were attacked here in the USA by a foreign invader sovern citizen should not be allowed to seek protection from any of the armed services. They gave up the chance to be part of the united states as well as their right to be protected by its armed forces. So in otherwords lets see how many soverns become unsovern whenthe dodo hits the fan. Thank you for this amazing article. You made this very difficult concept easy to understand. Sometimes that is so hard to do! Not everyone communicates in a kindly, thoughtful manner. I always enjoy your writing and your lessons!